Why to choose prodomo Ireland? Because experience & quality is not replaceable. 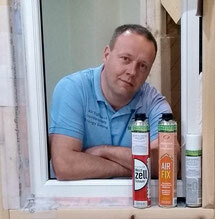 Hi, I´m Phil - the founder and CEO of German Building Solutions Ltd t/a prodomo Ireland. I´m a native German and have lived in Ireland since summer 2012. The uniqueness of the Emerald Isle fascinated me since my first holiday trip in 1994. After more than 20 visits I decided to leave Germany and settle in The Kingdom of Kerry. I was self-employed in the German construction business for more than 15 years. Mostly I´ve worked doing window installations and was specialising in airtight sealings and highly efficient insulation solutions. I also got the chance to work as CTO (chief technical officer) in a property management company during my last four years in Germany. This task deepened my already existing knowledge of building details and energy savings. After two years of settling and trial & error, I started as a self-employed air tightness installer in 2014. Fortunately my knowledge and the experience about air tightness products and installation technologies hasn´t gone lost, since I left Germany. I didn´t expect to install air tightness layers myself in more than 70 houses over the next 4 years when I started. But today I´m more than glad about this experience, which brought me to almost every detail of general Irish building standards. Personal interest was leading me to the decision, to buy a comprehensive blower door testing and thermal imaging equipment in 2016. Since 2017 I´m a member of the "German Association for Air Tightness in the Construction Industry (FliB e.V.)" and a NSAI registered air tightness tester. Any questions, comments or critics ?